Navua Sanatan players, officials and fans celebrate their Sanatan World Cup win at Prince Charles Park in Nadi on September 9, 2018.. Photo: Waisea Nasokia. 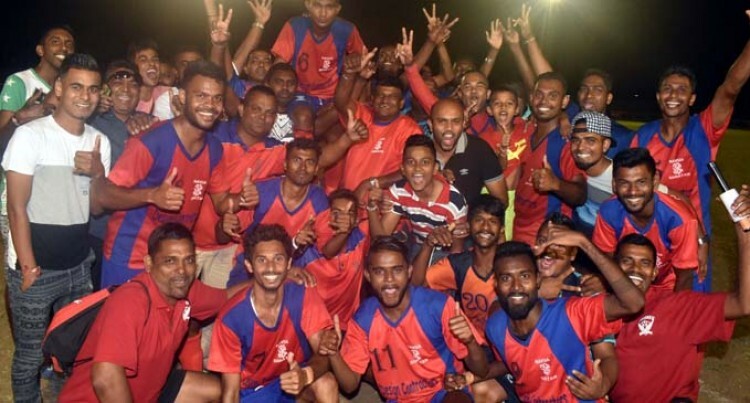 Nippy striker Sharad Kumar was the toast of the Navua side when he slotted in the winning goal as they beat Nadi 1-0 in the final of the 2018 Ram’s Group of Companies Sanatan World Cup at Prince Charles Park, Nadi last night. Kumar’s well-timed shot saw the ball sailed past goalkeeper Parmesh Chand into the net during the first half of the extra spell. Navua Sanatan team manager Pravin Singh said: “A big thank you to the boys and through their hard work we came out victorious. “We had a young team and we faced a lot of hurdles but what we achieved today is something we cannot explain. Nadi captain Ronald Dutt congratulated Navua for being a worthy opponent. In the semi-final, Navua edged out Varoka 1-0 while Nadi beat defending champions Queensland 7-6 on penalty kicks. In the other finals: Under- 15 New Zealand beat Nadi 1-0, in the 45+ Savusavu Sydney beat Canada 1-0 while again in the 40+ Savusavu Sydney pipped Lautoka NZ 1-0. The tournament was organised by the Sanatan World Cup Sports and Cultural Inc. and is sanctioned by the Fiji Football Association. The next Sanatan World Cup in 2020 will be hosted by Queensland.